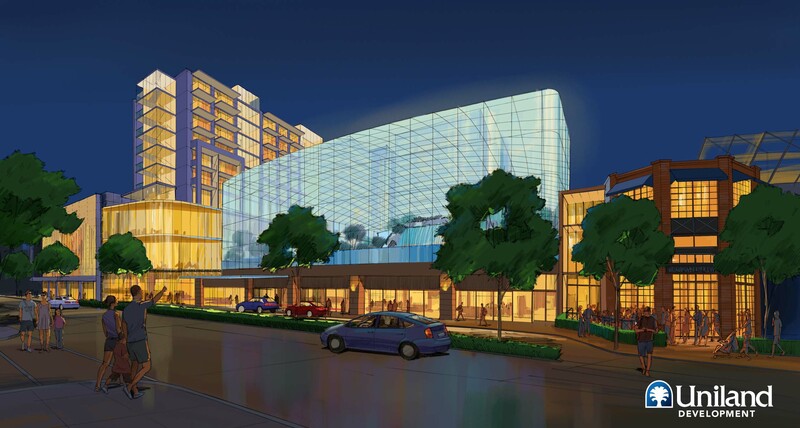 The proposed Wonder Falls Resort project will transform the remaining 200,000 square foot, two-block area of the former shopping mall largely vacant for more than a decade into a symbol of revitalization for this globally-recognized destination. The project’s centerpiece is a state-of-the-art, lushly landscaped indoor waterpark with a bounty of activities and amenities for guests of all ages. The resort also would offer approximately 300 guest rooms, include a 14-floor hotel tower with rooftop dining, and also a spa, and various retail and food and beverage venues. The resort is the latest step in the State’s work to help transform the former Rainbow Mall site, following the development of Niagara County Community College’s Niagara Falls Culinary Institute. With eight million tourists traveling to Niagara Falls each year, the resort is designed to encourage visitors to extend their stay in the City and view Niagara Falls as more of a year-round destination. New York State is in negotiations with Uniland Development Company on a development agreement. A project of this size, scale and complexity requires extensive due diligence to ensure that it will be a success for all parties. Uniland has been working steadfastly on project requirements, such as site analysis, geo-technical investigation, structural and seismic study, environmental report, design refinement and market analysis. Uniland is currently refining the design and its associated costs, interviewing potential operation partners, and preparing for investor and lender meetings. The redevelopment of the remaining 200,000 square feet of the former Rainbow Centre Mall is the next step in the transformation of downtown Niagara Falls. The property’s strategic location near Old Falls Street between Niagara Falls State Park and the Seneca Niagara Casino makes it an important development that could foster relationships between these areas and future development on adjoining parcels. Uniland Development Company was chosen as the preferred developer for the project. The public-private partnership of up to an estimated $150 million will be supported by Buffalo Billion funding.